The rugged mountaineers of the Highlands of Scotland were the first British regular infantry units to be employed in petite guerre operations. As such, Highlanders make a most natural addition to my range. Sculpting my first Highlander figure has been a bit of a challenge for a number of reasons. According to the sources available to me, the plaid consisted of a piece of wool cloth about 1.3 – 1.8 m long and 2.5 – 5 m wide, which was worn over the shirt and secured at the waist with a belt. After a few, unsuccessful attempts at sculpting the plaid directly from re-enactor pictures and illustrations found in uniform books, I decided that I needed to work from a three-dimensional model. For that purpose, I called back into service an old wooden artist’s mannequin. I cut a piece of cloth of a suitable size, and traced a simple grid on it to represent the basic lines of the tartan pattern. I then wrapped the piece of cloth on the mannequin, secured it at the waist with a rubber band, and tried to arrange it so as to reproduce the general effect shown in the illustrations and pictures found in the books and on the Internet. Most early to mid 18th-Century pieces of pictorial evidence show the skirts of the plaid open at the wearer’s front. Almost no period representations go into such detail as to show how the skirts actually overlap, but the very few that do definitely show them overlapping right-over-left, which arrangement I choose to follow (despite the fact that later representations, such as McIan’s well-known engravings from the 1840s, show just the opposite, and most modern illustrations follow this later pattern). The next issue I faced was determining how the waistcoat and jacket were worn in relationship to the belted plaid. Some early sources show no jacket, with the waistcoat tucked into the plaid. Others again show no jacket, but the waistcoat worn over the plaid. The Cloathing Book of 1742 has a soldier of the 43rd Highland Regiment, the Black Watch, wearing both jacket and waistcoat over the plaid. Interestingly, the jacket is shorter than the waistcoat, an odd enough order of dress that I nevertheless choose to retain in my figure. The Cloathing Book also shows an unusual button arrangement for both waistcoat and jacket, but I opted for the simpler pattern shown in all other period images known to me. My Highlander is equipped with waist cartridge box and canvas haversack. He is armed with basket-hilt broadsword, and Long Land Service musket with bayonet. In order not to further encumber an already rather bulky figure, I decided to omit dirk and all-metal pistol, which, albeit seemingly popular with all ranks of Highland units, were non-regulation weapons and were not supplied by the Government. 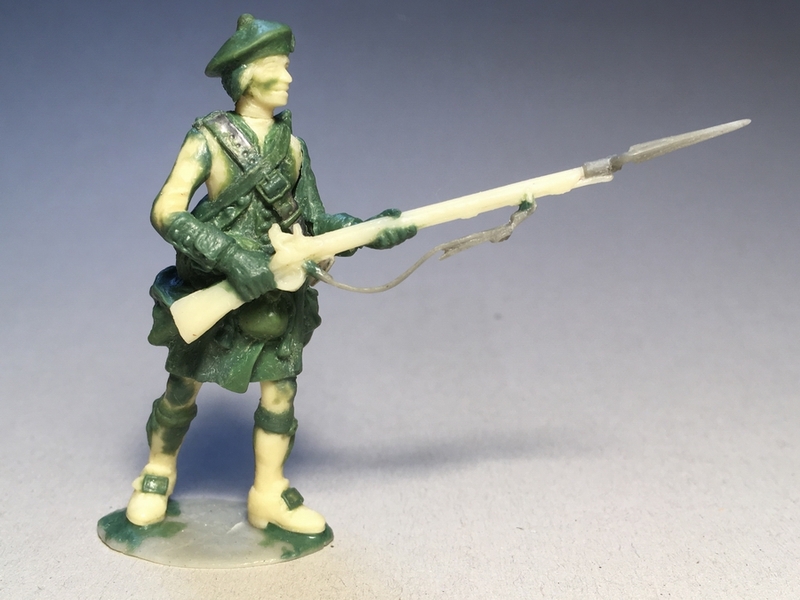 All in all, this figure represents a typical enough Government Highlander of the 1740s and 1750s: a soldier of the 43rd (later 42nd) or the 64th regiments, or perhaps of one of the many independent companies performing police duty in the Highlands of Scotland, or serving overseas. The Cloathing Book of 1742, Facsimile reproduction, The Naval and Military Press. Darling, A., Weapons of the Highland regiments, Museum Restoration Service, 1998). Scott, J.G., Scottish arms – Illustrated by pieces from the collection in Glasgow Art Gallery and Museum. Armi Antiche – Bollettino dell’Accademia di S. Marciano – Torino, 1963. An excellent figure, thanks to your talent and attention to sources. I enjoy how you go your own way, when considering what you will include, and what you choose not to.